The primary function of maps has always been wayfinding (how do I get from A to B?). But standard maps don’t serve that function as well as route maps. These show one path of travel, and can do so with much greater detail than a standard map affords: what will you see, where to stay, etc. on a given trip. 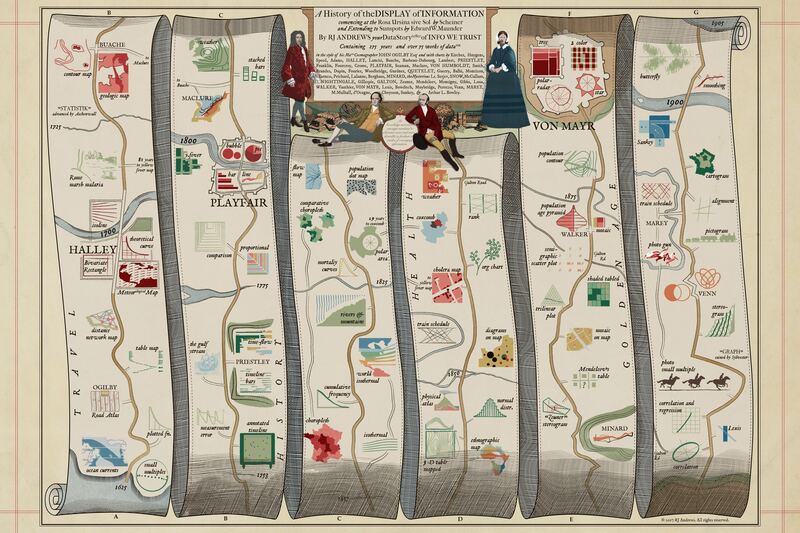 This image, by Raymond Andrews gives a tour of the history of the graphic display of information as a route map in time. Start the tour at the bottom left (A) and follow the route to see what appears along the way. There are rivers to cross, and attractions to see. Occasionally, a short-cut to a later time appears, as in a trip thru IKEA. This trip ends at the terminus of Galton Road with the invention of the correlation diagram, later called the “data ellipse”. See: http://datavis.ca/milestones/ for the complete history.